After being authorized by the Gold Bullion Coin Act of 1985, the American Gold Eagle coin was released in 1986 and became United States` official gold bullion coin. Founded in 1792, the United States Mint is worldwide recognized for its meticulously made legal tender circulating coinages. The US Mint also manufactures American Eagle Proof coins that are destined to collectors. The proof coins have a limited mintage and can be bought from the US Mint. The denominations in which the Gold American Eagle coin is available are: 1/10 oz with the face value of $5, 1/4 oz has a face value of $10, 1/2 oz $25 face value, and 1 oz sizes whose face value is $50. These varieties of the Gold American Eagle are guaranteed by the US government to contain the amount of gold weight in troy ounces that is stated on the coin`s reverse. The face values do not reflect their intrinsic value which is determined by the troy weight of gold and by its current price. The American Gold Eagle coins are legal tender, are a legal method of payment of public and private debts. In manufacturing the American coins, gold is alloyed with 3% silver and 5.33% copper to make the coins more wear resistant, the purity of gold is of 22K or 91.67% gold. Also, it is stated by law that the gold must have as source the American mines. 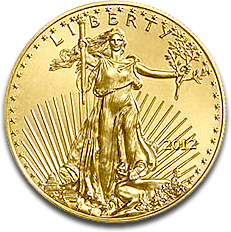 When traded by investors, the American Gold Eagle coins are not sold or bought at their face value. Usually, their price is determined by the gold spot price. For example, the 1/10 troy ounces American Gold Eagle that has a face value of $5 could be traded for, let`s say, $200 because as we all know the gold`s price has increased in the last years. The American Gold Eagle coin`s reverse depicts the American symbol in the form of male eagle that flies above a nest with an olive branch in his peak. In the nest are found a female eagle and her hatchlings which are a symbol for the strength and security of American families. This design has been made by sculptor Miley Busiek. On the obverse, the proudly, graceful, and full length figure of Lady Liberty is shown, with the Capitol building in the left background. Lady Liberty has a flowing hair and holds a torch in the right hand and an olive branch in her left which is a rendition of the Saint-Gaudens Double Eagle` design. Since being produced in 1986, the American Gold Eagle coin became among the world`s largest traded bullion gold coin. Many investors in gold in the form of bullion gold coins choose the coins facing the symbol of United States` freedom, the American eagle. The American Gold Eagle coins are perfect for investors to diversify their portfolios because these coins represent a convenient, easy, and affordable way of trading gold. The coins have these characteristics because they come in different denominations which have their corresponding prices, higher or lower. By adding gold on their assets` list, investors believe that they may improve the performance of their portfolios and also reduce its volatility. The American Gold Eagle coin`s value moves independently from the value of stocks and bonds so in hard and unsecure financial times it is best to turn to gold as an investment, to have liquidity. What does liquidity mean? It is the speed at which assets can be transformed into cash. So it`s advisable to have between your assets the beautiful, artistry, and international American Gold Eagle coin which can be sold to precious metals dealers worldwide.